Rugs are a valuable decorating tool for adding the right kind of polish to a room, and for making hard floors softer for babies. They are also an incredibly useful way of sectioning a space, so can help provide physical boundaries for young children when needed. There’s a new rug on the block over at Wooli, which we featured for its soft storage solutions in June. 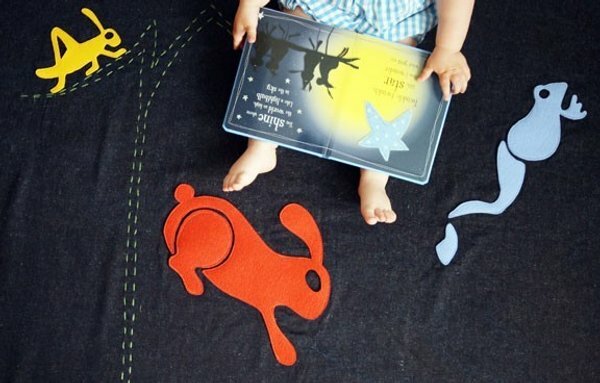 The Wooli Hop floor mat is a super addition to your child’s nursery. 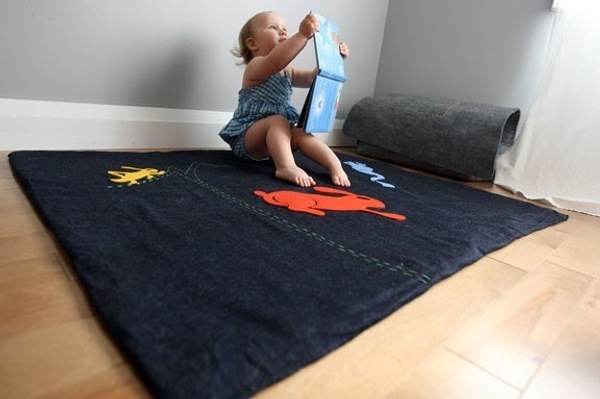 It has three kinds of jumping creatures on it – a frog, a grasshopper and a rabbit, and will make any hard floor a nice padded one whilst baby needs lots of floor time. It also makes a great conversation piece and story-starter for toddlers and preschoolers. The Hop floor mat is made with thick wool padding with an organic denim cover – fully washable of course. It’s US$175 plus shipping from Wooli.